SHOP ANYWHERE AND FEAST FOR FREE! 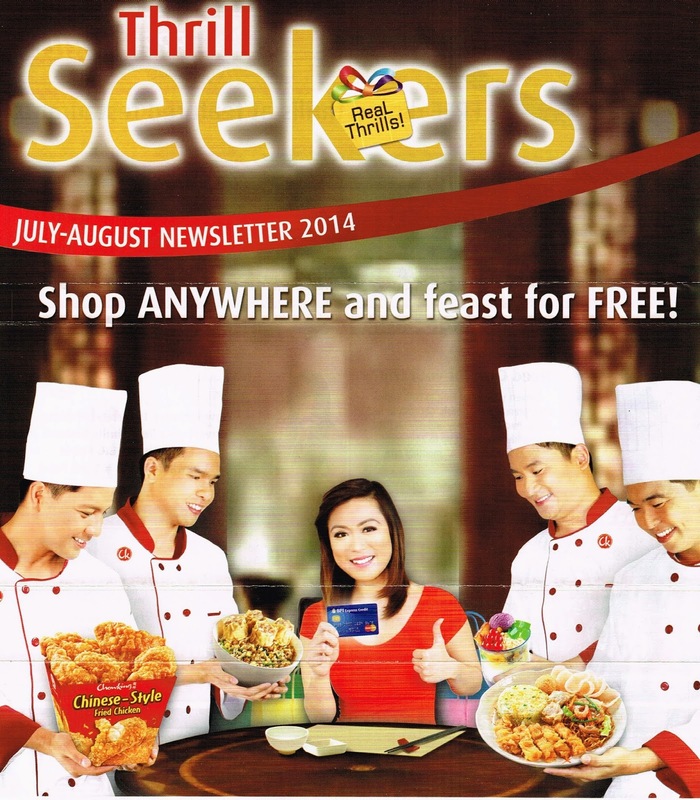 BPI Express Credit, Use your BPI Express Credit anywhere and indulge in free Chowking feasts! For minimun single receipts of P2,500, P6,000 or P12,000 from July 1 to August 31, 2014. Redemption until October 31, 2014. Per DTI-NCR Permit No. 5200, Series 2014. ALBA - Buy 1, Get 1 on Lunch Buffet from Mondays to Thursdays. Promo until August 15, 2014. Per DTI-NCR Permit No. 5390, Series of 2014. GINZA BAIRIN - Free Special Katsudon for a minimum spend of P500 from Mondays to Fridays. Promo until October 31, 2014. Per DTI-FTEB SPD Permit No. 0041, Series of 2014. IL PADRINO - Buy 1, Get 1 on featured medium-sized beverages. Promo until October 15, 2014. Per DTI-NCR Permit No. 5490, Series of 2014. MEXACALI - Buy 1 Chili Con Carne and Get Free Ground Beef Taco, Basket of Plain Fries or Cheese and Garlic Quesadilla. Promo until August 31, 2014. Per DTI-NCR Permit No. 4706, Series of 2014. RECIPES - Free Vegetable Kare Kare, Crispy Bangus or Gising gising for minimum spend of P500. Promo until October 31, 2014. Per DTI-NCR Permit No. 5388, Series of 2014. Need Cash for your trip? Convert your credit limit to cash with BPI Express Credit-to-Cash. Get cash as fast as the next banking day and pay on fixed monthly installment up to 24 months for as low as 0.99%* monthly rate. *Rate is valid for 12, 18, and 24-month terms. *Effective interest Rate (P.A.) of 21.37% on 24-month term. Terms and COnditions apply. ULTRA MEGA - Free KIT KAT Multipack for every P1,000* spend at Ultra Mega Supermarket. *Inclusive of 1 KIT KAT product promo is from July 15 to September 15, 2014. Redemption until November 15, 2014. Per DTI-NCR Permit No. 5728, Series of 2014. WESTERN APPLIANCES - Free Oster Personal Blender for minimum single receipt installment purchase of P40,000. Free AsahiElectric Kettle for minimum single receipt installment purchase of P25,000. *Real 0% is available up to 24 months on select items. Promo until September 15, 2014. Per DTI-NCR Permit No. 5525, Series of 2014. Shangri-La's Boracay Resort & Spa Philippines - Exclusive rate on Deluxe Seaview Room at P14,300++/night with dinner buffet for two. Promo until December 25, 2014. CRIMSON RESORT & SPA | MACTAN, CEBU - 40% OFF on Villas based on Best Available Rates with 15% OFF on food and beverages. Promo until December 31, 2014. AUM SPA & WELLNESS CENTER - 20% OFF on all spa services. Promo until December 31, 2014. MESA FILIPINO MODERNE - Get a P500 MESA Gift Certificate for a single receipt of P5,000 of a free Tinapa Roll for minimum of P1,000. Promo until December 31, 2014. THE SPA - 15% OFF on Annual Membership. Promo until December 31, 2014. BLISS YOGA - 15% OFF on all packages. Promo until December 31, 2014. LOUIS PHILLIP KEE PREMIER SALON - 15% OFF for minimum of P3,000. Branch The Fort, C5 Acropolis, Makati, Banawe. Promo until December 31, 2014. BROTHERS BURGER - 10% OFF for every P500 food purchase. Promo until June 9, 2014. Per DTI-NCR Permit No. 4834, Series of 2015.
PEPPER LUNCH - Free Beef Pepper Rice for minimum single receipt purchase of P1,000. Promo until June 9, 2015. Per DTI-NCR Permit No. 4834, Series of 2014. RECESS BY CHEF CHRIS - Free Pavlova or Special Turon for minimum single receipt purchase of P1,000. Promo until June 9, 2015. Per DTI-NCR Permit No. 4834, Series of 2014. WINGMAN - 15% OFF on all purchases. Promo until June 9, 2015. Per DTI-NCR Permit No. 4834, Series of 2014. AGODA.COM - Up to 7% OFF on all hotels worldwide book now via www.agoda.com/bpicards. Promo until December 31, 2014. Per DTI-NCR Permit No. 0346, Series of 2014. ASIATRAVEL.COM - 10% OFFon hotel published rates Use promo code: BPI-TRAVEL. Book now via bit.ly/bpiatph. Promo until August 31, 2014. Travel period until December 31, 2014, Per DTI-NCR Permit NO. 4707, Series of 2014. EMIRATES - Up to 10% OFF on Erimates flights to the Americas, Europe and Dubai. Use Promo Code: PHBPI77. Book now via www.emirates.com/ph/bpi. Promo until August 31, 2014. Travel period until December 10, 2014. Per DTI-NCR Permit No. 4189, Series of 2014. Avail at any BPI Branch nearest you. http://www.bpicards.com for complete promo mechanics and upcoming programs.